What's the biggest challenge you face in service planning? Scheduling personnel? Timing the service plan? Important tasks to be sure, but are they really the most important? What about deciding what will go in the service–the right songs, scripture, and readings that will coalesce to quicken the minds and touch the hearts in your congregation? Is it enough to pull song titles from a list of favorites or should there be more? And if so, who or what helps with that? 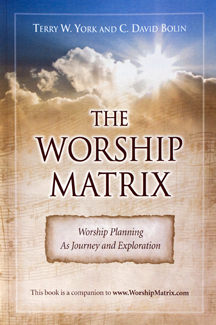 The Worship Matrix is an interactive online resource by which worship leaders thoughtfully approach service planning as journey and exploration. •Identify connections between scripture, hymn texts, meditations, and other readings to assimilate a cohesive service plan. •Plan months in advance; store and retrieve service data from previous years. •View multiple plans on the same screen and move items between them. •Connect to other websites and documents using Weblinks. •Maintain an entire music library providing online access wherever you are. •Collaborate with your worship team to assemble a great service plan. •Manage promotional announcements for service publications. •Prepare reports in a variety of formats for the congregation and worship facilitators.